"Smith and Bybee Lakes, Oregon"
Click image to enlarge Smith Lake, Oregon. View from the Smith and Bybee Lake Wildlife Area canoe launch. 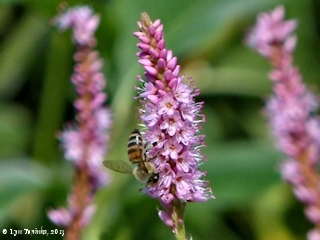 Image taken September 14, 2008. 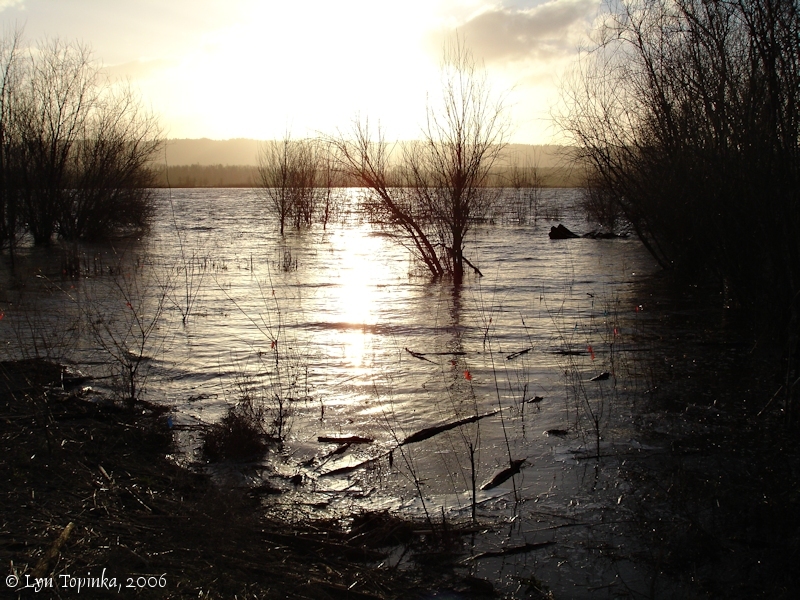 Smith and Bybee Lakes are two wetland areas located within Portland, Oregon, which are being revived to their natural state. A new 30-foot-high water control structure was built in 2003. 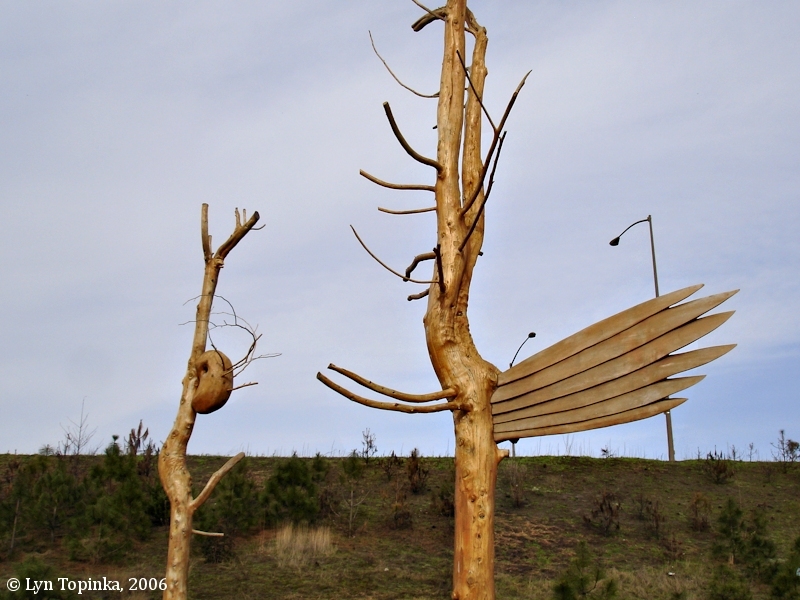 Once part of a landfill, the area now is being returned to sloughs, wetlands, and forests. 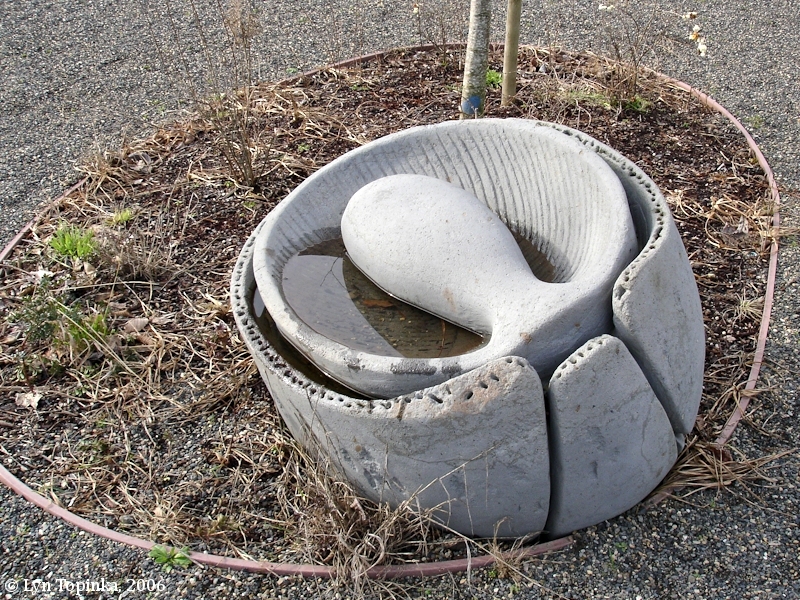 Wapato, once plentiful and considered a main food source by the Indian tribes along the lower Columbia, is making a comeback. 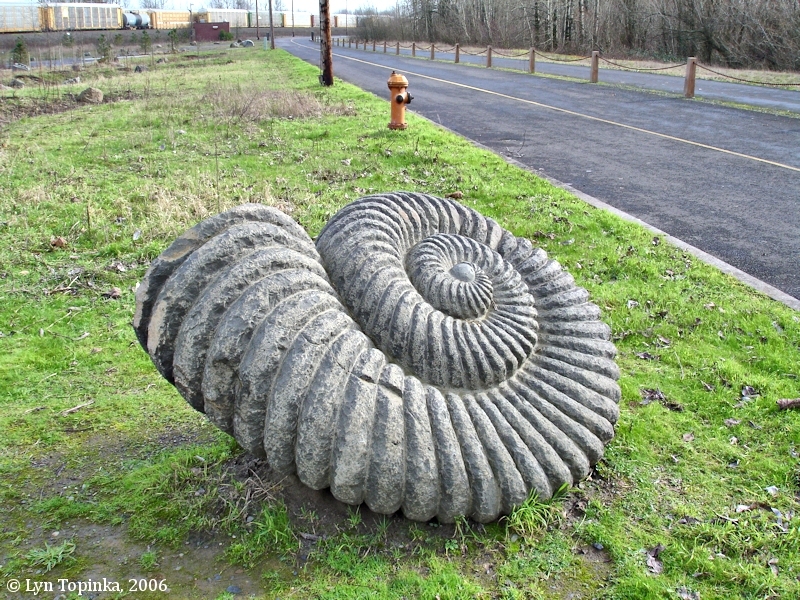 The two lakes, while surrounded by commerce and industry, are generally bordered by the Columbia Slough on the south, Kelley Point on the west, Force Lake and the Vanport Wetlands on the east, and the Columbia River on the north. Click image to enlarge California Poppies, Smith Lake, Oregon. View from the Smith and Bybee Lake Wildlife Area canoe launch. 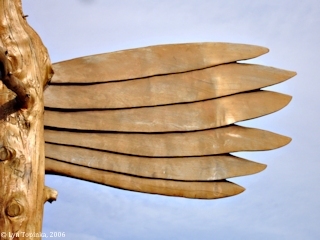 Image taken September 14, 2008. 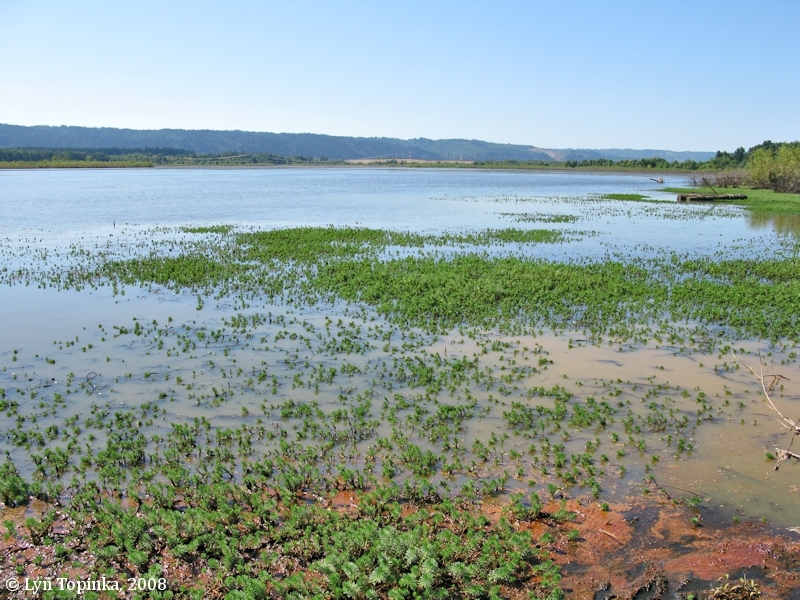 Click image to enlarge Nodding Beggar Ticks, Smith Lake, Oregon. View from the Smith and Bybee Lake Wildlife Area canoe launch. 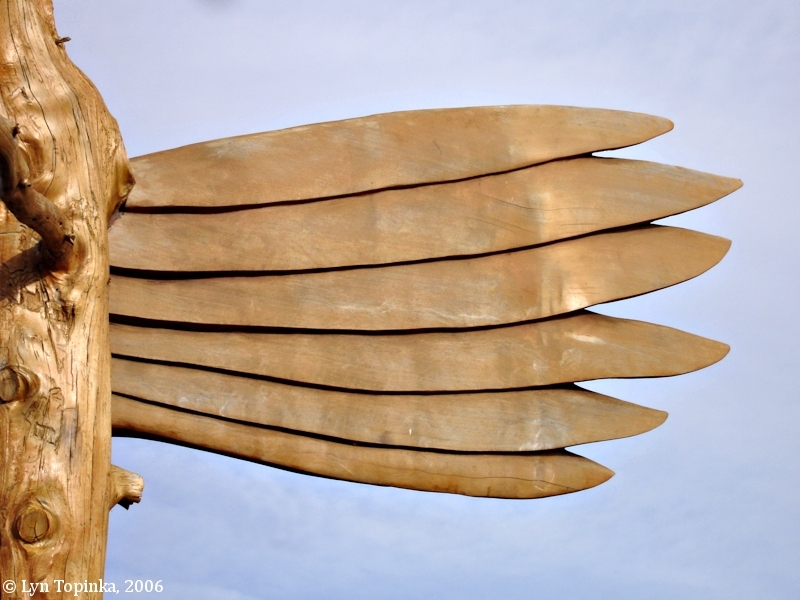 Image taken September 14, 2008. 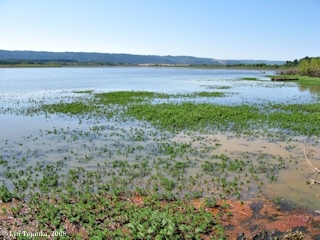 Click image to enlarge Water Smartweed, Bybee Lake, Oregon. View from the Smith and Bybee Lake Wildlife Area near Bybee Lake blind. Image taken September 7, 2013. The Smith and Bybee Lakes Wetlands Natural Area is the largest protected wetlands within an American city, covering nearly 2,000 acres. Wildlife viewing opportunities include beaver, river otter, black-tailed deer, osprey, bald eagles and Western painted turtles. 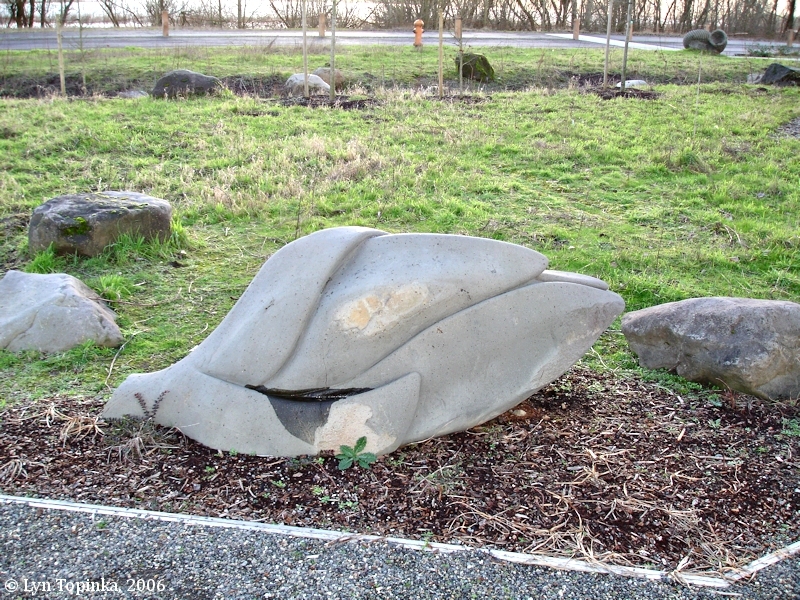 The wildlife area includes a paved, accessible trail, two wildlife viewing platforms, a canoe launching area, restrooms, interpretive displays, covered shelter, parking, and "environmental art" (see more below). Click image to enlarge Smith Lake, Oregon, Sunset. View from the Smith and Bybee Lake Wildlife Area. Image taken February 4, 2006. 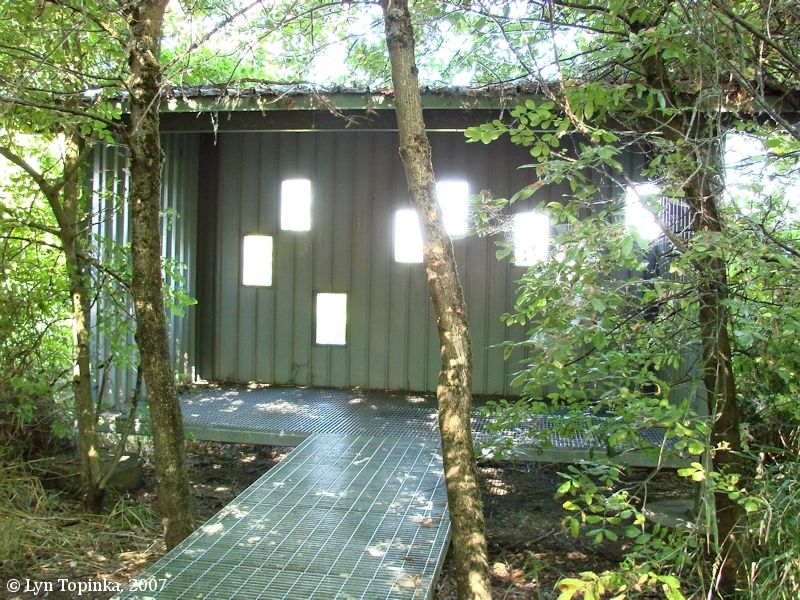 Click image to enlarge Bird Blind, Bybee Lake, Oregon. View from the Smith and Bybee Lake Wildlife Area bird blind. 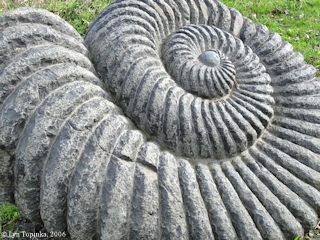 Image taken August 23, 2007. 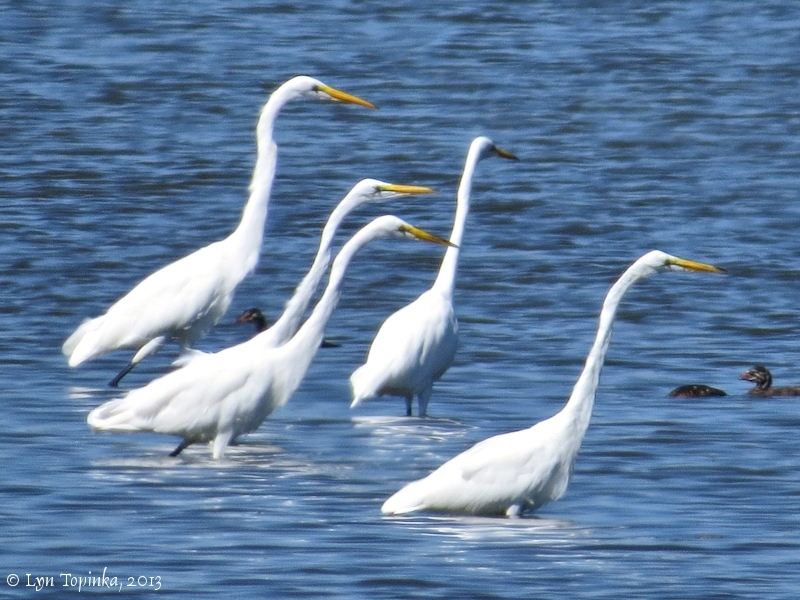 Click image to enlarge Great Egrets, Bybee Lake, Oregon. View from the Smith and Bybee Lake Wildlife Area bird blind. 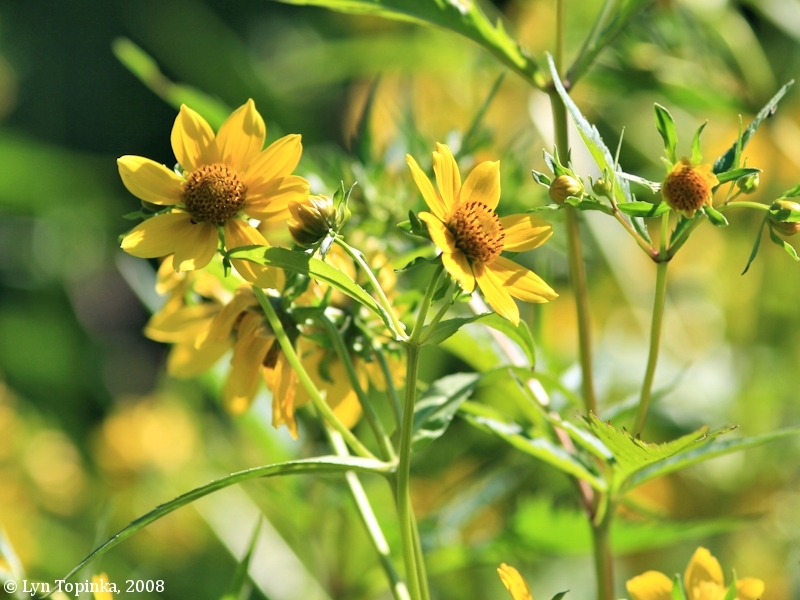 Image taken September 7, 2013. Smith Lake was named for ??? 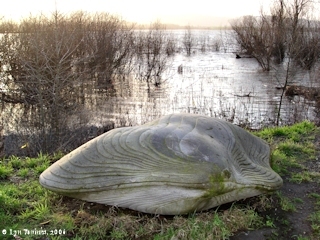 According to Oregon Geographic Names (McArthur and McArthur, 2004), Bybee Lake was named for James Bybee who settled in 1853 on property which included most of the lake. James Bybee (and not nearby settler James F. Bybee) was granted title to the property in November 1859 (Land Office certificate #2234). The U.S. Bureau of Land Management General Land Office Records (GLO) website (2007) has a listing for James Bybee (#2234) being granted title on August 5, 1871, for 313.52 acres of T2N R1E Sections 30 and 31, through the 1850 Oregon Donation Act. The U.S. Bureau of Land Management General Land Office Records (GLO) website (2007) also has a listing for William Bybee (#3339) being granted title on June 13, 1873, for 320.15 acres of T2N R1W Sections 24 and 25 through the 1850 Oregon Donation Act. Today's Bybee Lake stretches northwest to southeast and occupies a large portion of T2N R1W Section 25, and T2N R1E Section 31. Smith Lake occupies a large portion of T2N R1E Sections 31 and 32. The 1862 cadastral survey map (tax survey) for T2N R1W shows a "Wm. Bybee" claim (Claim No.44) of 246.80 acres in Section 25. The 1888 U.S. Coast and Geodetic Survey's Chart "Columbia River, Sheet No.6, Fales Landing to Portland" have Smith and Bybee Lakes depicted but not named. The 1947 U.S. Coast and Geodetic Survey's Topo Map "Portland No.11" (1:9600) has Smith and Bybee Lakes named. Today Bybee Lake is north and west of Smith Lake. 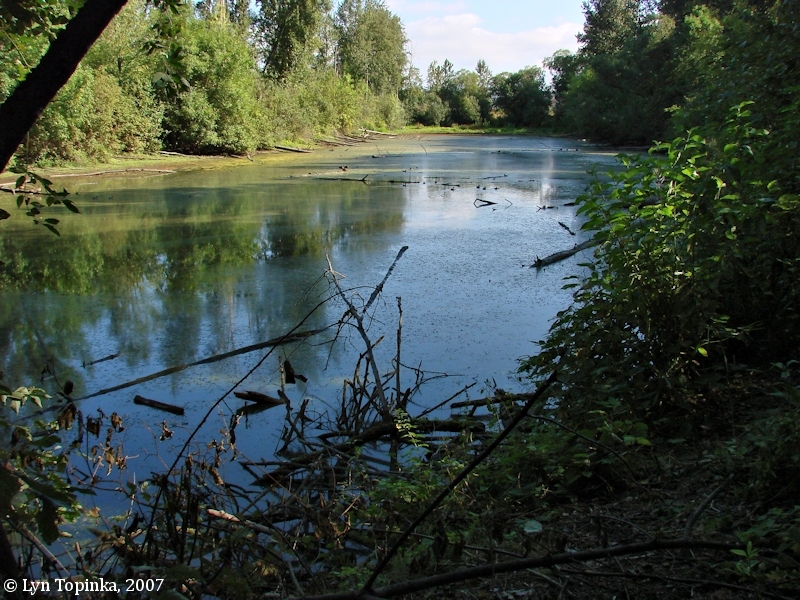 The Columbia Slough is on the south and west borders, with the North Portland Harbor to the north and east. Click image to enlarge Slough near Bybee Lake, Oregon. View from the Smith and Bybee Lake Wildlife Area. Image taken August 23, 2007. 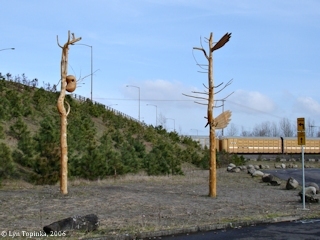 Smith and Bybee Lakes Wildlife Area is home to a Portland Public Art project called "Flows and Eddies". 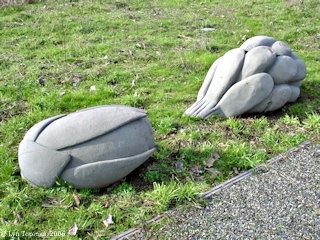 "Flows and Eddies" was designed and installed in 2004 by artists Valerie Otani and Fernanda D'Agostina, and comprises "Ecology Stones", "Mussel Shell", "Habitat Reefs", "Habitat Trees", and "Seasonal Encampment". 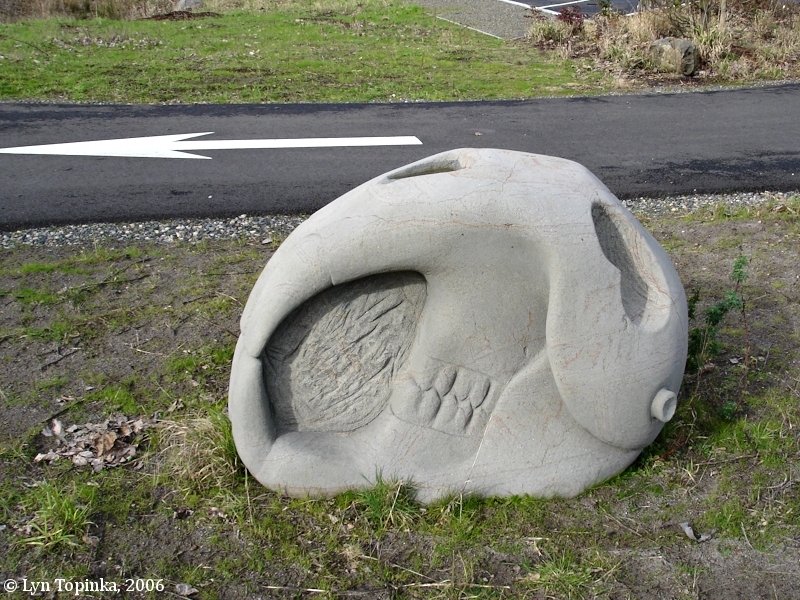 Near the parking area are pieces of sculpture - "Ecology Stones" - which look like seedpods, skulls, flower buds, diatoms, native tools, and even a turtle egg embryo. 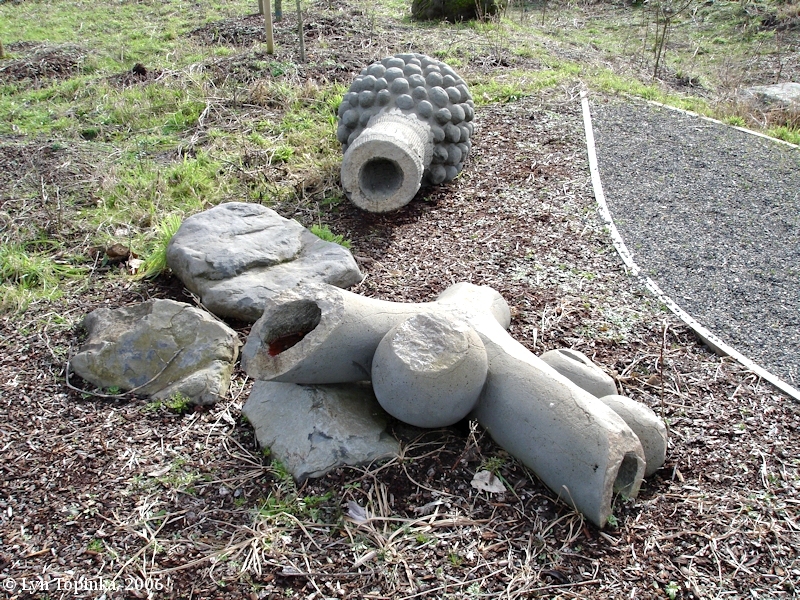 Description: "Forms found in the natural habitat of the lakes are carved in monumental scale basalt boulders, creating a "teaching landscape" that awakens viewers to the rich plant and animal life that surrounds them." Click image to enlarge Parking area, Smith and Bybee Lakes Wildlife Area. Image taken February 5, 2006. 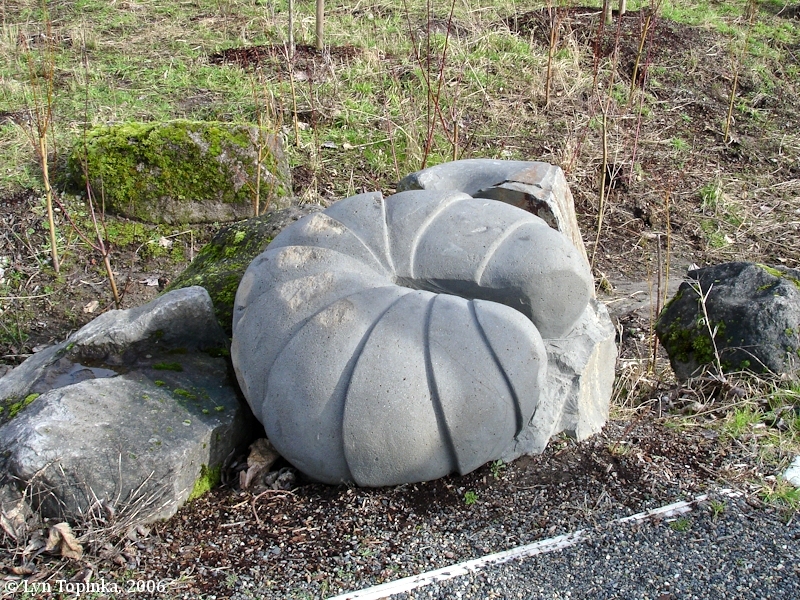 Click image to enlarge Shell Sculpture, near Smith Lake, Oregon. View from the Smith and Bybee Lake Wildlife Area. Image taken February 5, 2006. Click image to enlarge Closeup, Shell, near Smith Lake, Oregon. View from the Smith and Bybee Lake Wildlife Area. Image taken February 5, 2006. 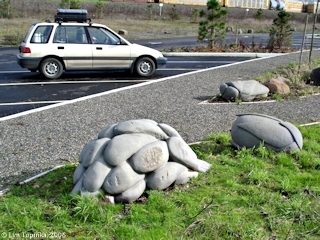 Click image to enlarge Sculptures, near Smith Lake, Oregon. View from the Smith and Bybee Lake Wildlife Area. Image taken February 5, 2006. 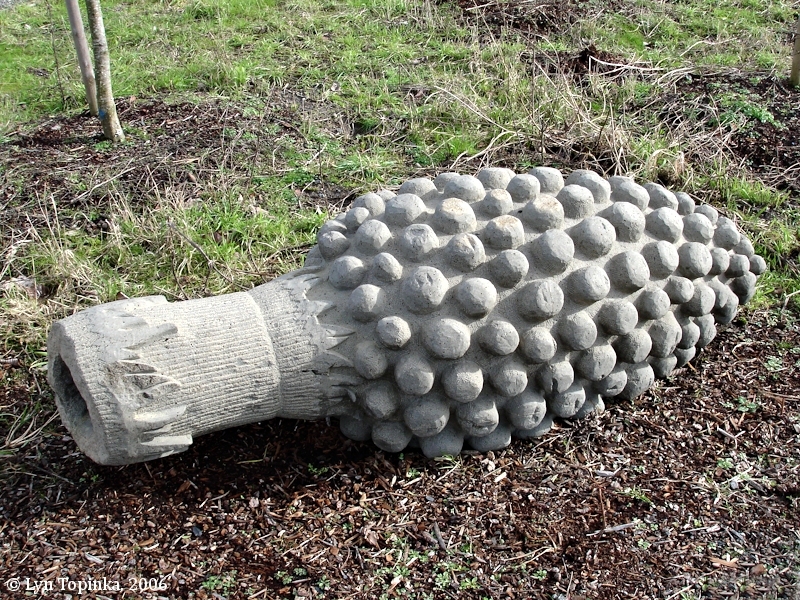 Click image to enlarge Sculpture, near Smith Lake, Oregon. View from the Smith and Bybee Lake Wildlife Area. Image taken February 4, 2006. Click image to enlarge Skull Sculpture, near Smith Lake, Oregon. View from the Smith and Bybee Lake Wildlife Area. Image taken February 5, 2006. Click image to enlarge Sculpture, near Smith Lake, Oregon. View from the Smith and Bybee Lake Wildlife Area. Image taken February 5, 2006. Click image to enlarge Two Sculptures, near Smith Lake, Oregon. View from the Smith and Bybee Lake Wildlife Area. Image taken February 5, 2006. 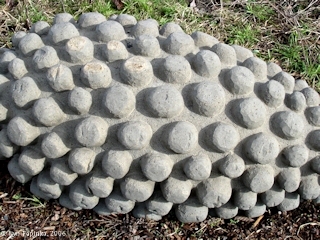 Click image to enlarge Closeup, Sculpture, near Smith Lake, Oregon. View from the Smith and Bybee Lake Wildlife Area. Image taken February 5, 2006. A Mussel Shell is located at the path to the canoe launch. 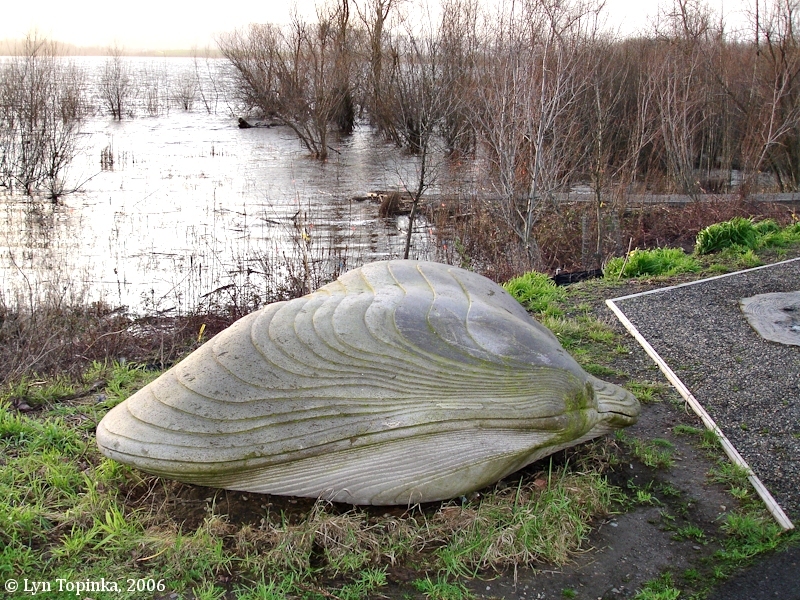 Description: "A large carved stone based on the fresh water mussels found in the lakes marks the entrance to the canoe launch. The lines of a mussel’s shell mark the years of its life. A second mussel shell paving stone is etched with the dates and cycles of time of important events in the history, prehistory and natural history of the lakes, making note of the ‘deep time’ found in wild places." Click image to enlarge Freshwater Mussel, Smith Lake, Oregon. View from the Smith and Bybee Lake Wildlife Area. Image taken February 5, 2006. 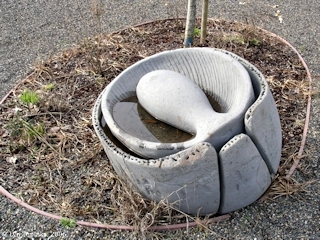 Click image to enlarge Freshwater Mussel, Smith Lake, Oregon. 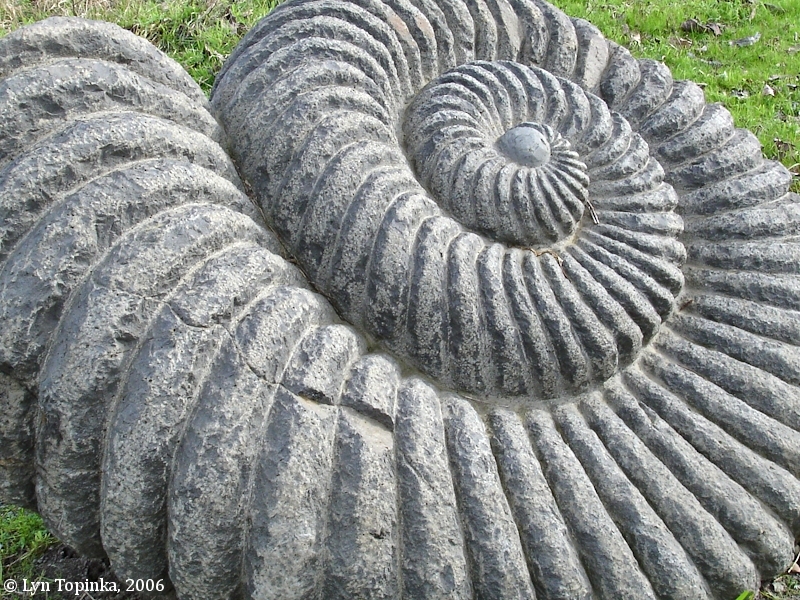 The Mussell "paving stone" is just visible on the right. View from the Smith and Bybee Lake Wildlife Area. Image taken February 5, 2006. 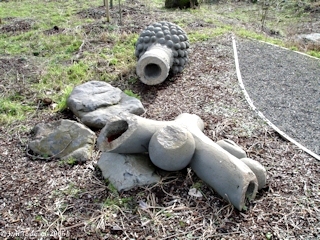 Description: "Large Cedar root balls salvaged from Mount Saint Helens act as landmarks in the water near the canoe launch, allowing visitors to observe the processes of dynamic change in the lakes. In collaboration with naturalists we created ‘Habitat Reefs’ of large woody debris, chosen as both beautiful examples of growth patterns in native trees, and for their ability to create a new habitat in the lakes. As the waters of the lakes rise and fall, different parts of the trees will be revealed. 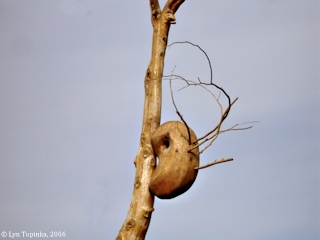 Over time small ecosystems will form around the decaying tree parts." 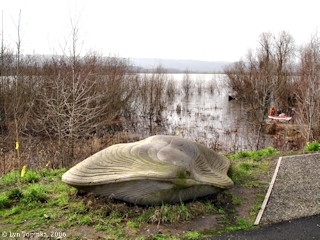 Click image to enlarge "Habitat Reefs" and "Habitat Trees" sculptures at Canoe Launch, Smith Lake, Oregon. View from the Smith and Bybee Lake Wildlife Area. Image taken February 4, 2006. 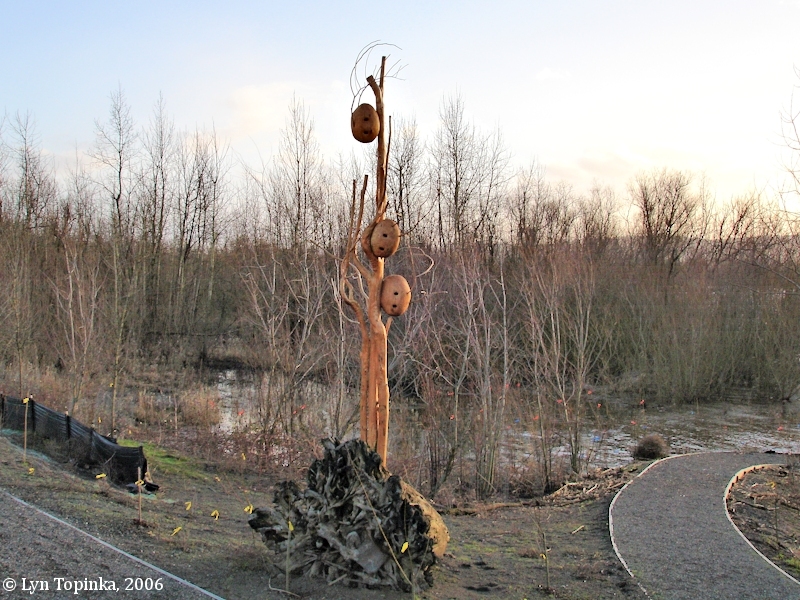 Seven sculpted wooden poles resembling snag trees can be found in the Smith and Bybee Lakes Wildlife Area. 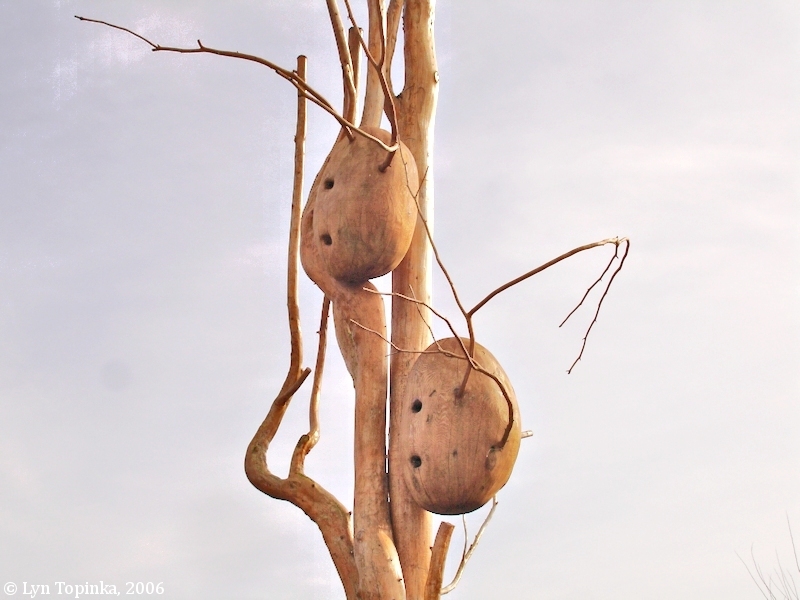 The "Habitat Trees" are designed to provide perches and nesting sites for swallows, purple martins, bats, owls and other wildlife. 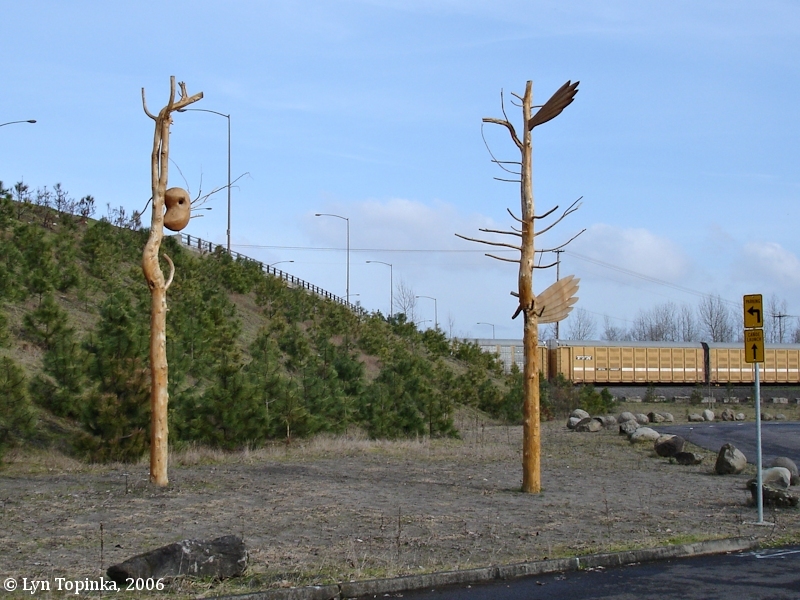 Description: "The seven “Habitat Trees” at Smith and Bybee Lakes provide nest sites and perches to Tree Swallows, Purple Martins, Warblers, Kestrals, Screech Owls and Bats. 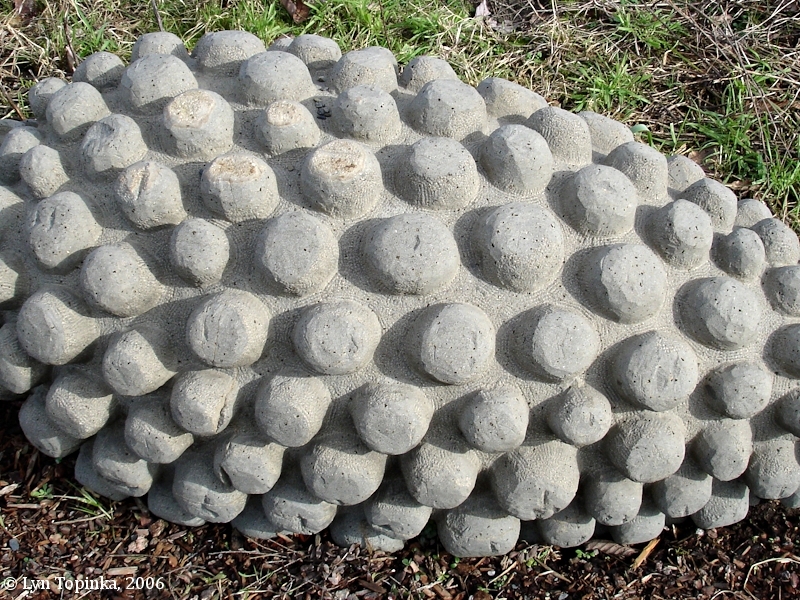 The nest sites were developed in collaboration with Metro Naturalists and Audubon Society staff. 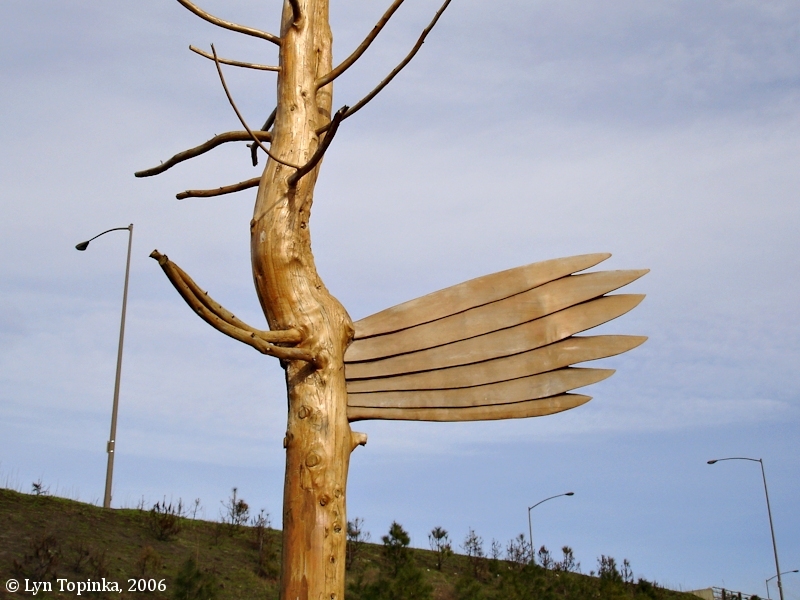 Our intention is that the “Habitat Trees” articulate in dramatic and eye catching ways the peculiar nesting habitats of some of the birds and mammals of the lakes. 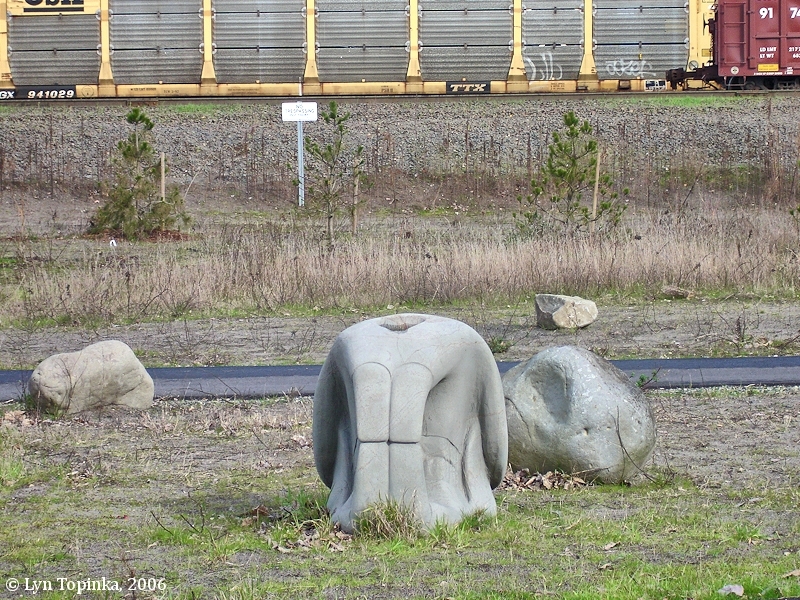 They also stand as sentinals at three of the critical crossroads of the park’s road and trail system. Finally, although the designs are unique and original, the materials and methods of carving recall local traditions. We hope their drama and quirky character will provoke park visitors to take a closer look at the birds and animals around them." 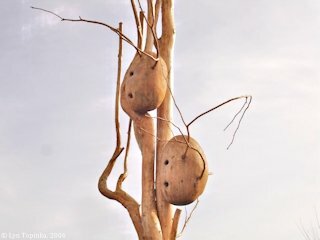 Click image to enlarge Snag Birdhouses, Smith Lake, Oregon. View from the Smith and Bybee Lake Wildlife Area, canoe launch. Image taken February 5, 2006. Click image to enlarge Snags, Smith Lake, Oregon. View from the Smith and Bybee Lake Wildlife Area, parking area. Image taken February 5, 2006. 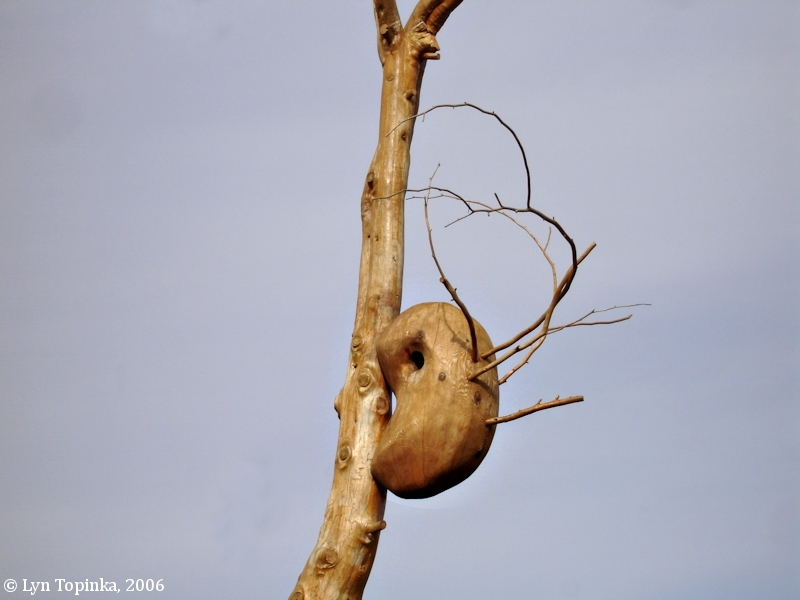 Click image to enlarge Snag Birdhouse, Smith Lake, Oregon. View from the Smith and Bybee Lake Wildlife Area, parking area. Image taken February 5, 2006. Click image to enlarge Snag Section, Smith Lake, Oregon. View from the Smith and Bybee Lake Wildlife Area, parking area. 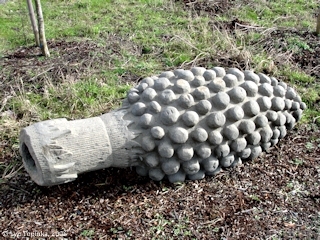 Image taken February 5, 2006. Click image to enlarge Snag Wing, Smith Lake, Oregon. View from the Smith and Bybee Lake Wildlife Area, parking area. Image taken February 5, 2006. 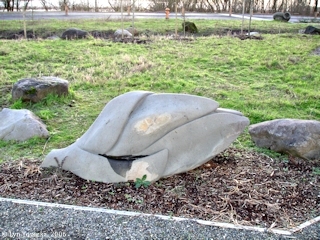 Two Chinook dugout canoe sculptures are located near the edge of Smith Lake near the public parking area. 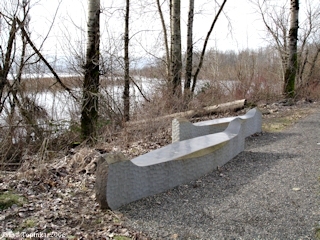 The canoes are carved from pieces of columnar basalt. 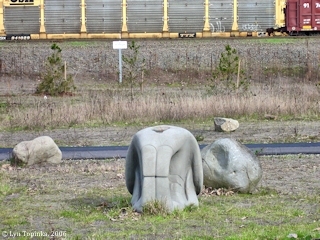 Description: "The detention ponds located near Smith Lake allow for a teaching moment along the trail. 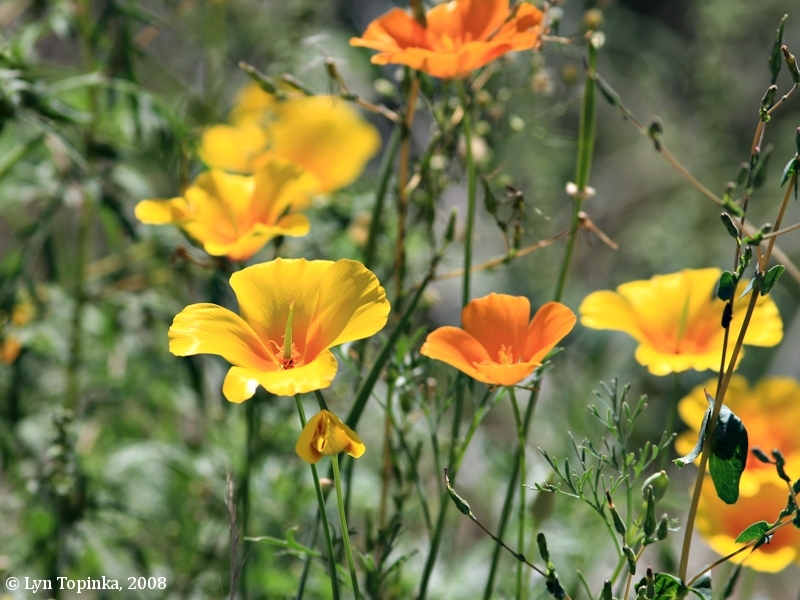 Rich with plants such as wapato, camas, and nettles, it shows a landscape that Native Americans depended on. 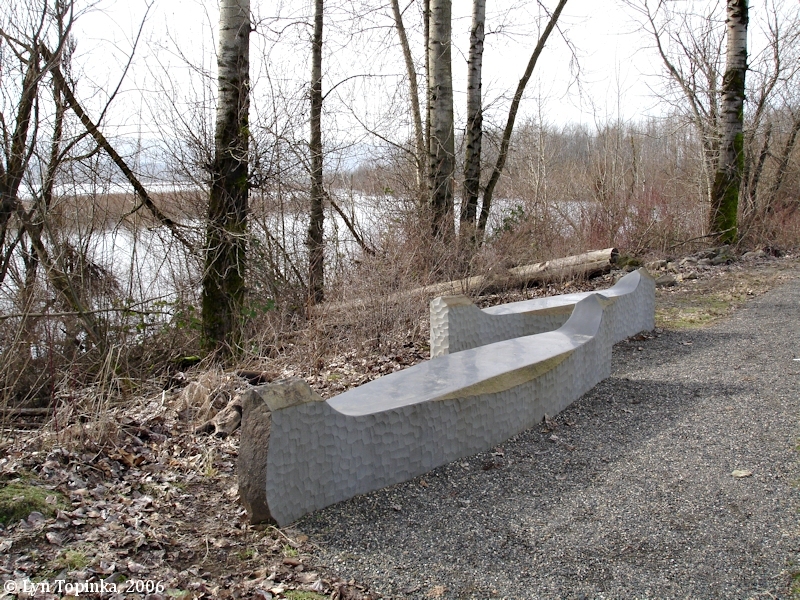 Inspired by the forms of Chinook canoes, the sculptural elements carved from columnar basalt evoke the use of the lake as a seasonal encampment for fishing and harvesting. 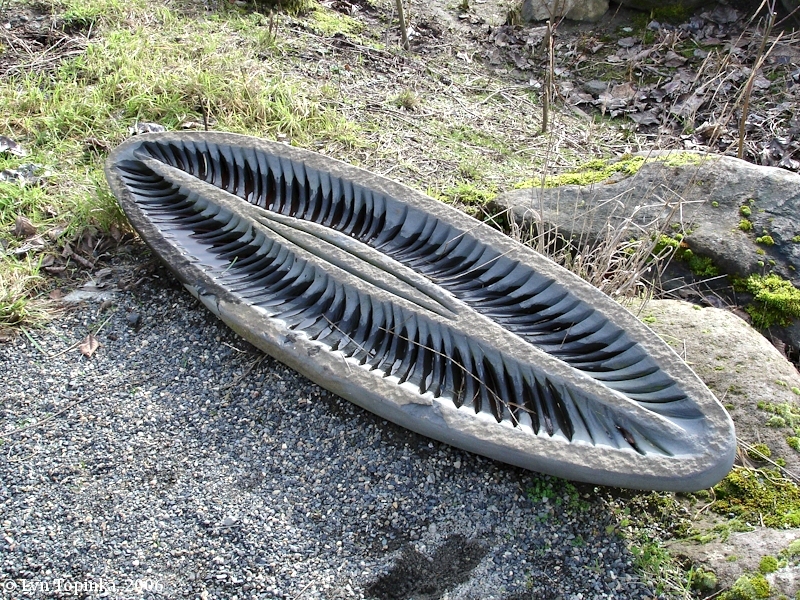 The Chinook were famous for their dugout canoes that allowed them to establish an extensive trading network throughout the Columbia River basin. The casual grouping of the canoe forms evokes an interrupted moment in daily life, and creates an emotional connection between past and present." Click image to enlarge Basalt Canoes, Smith Lake, Oregon. Smith Lake is in the background. View from the Smith and Bybee Lake Wildlife Area. Image taken February 5, 2006.